To begin your website design training, you will create a personal banner graphic for your resume site using Adobe Photoshop. You will have approx. 2-3 classes to complete this challenge. CLICK HERE to view a sample banner. Clear use of layer, image and/or transparency effects. BIG HINT! 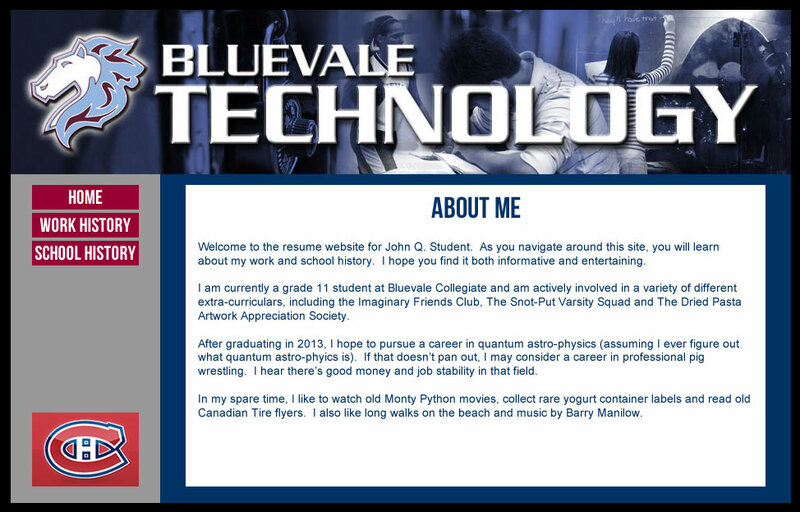 Complete one page, including banner, navigation bar/buttons and content. Save this page as a PNG file. When done, choose SAVE AS from the File Menu and save two additional copies as your other pages. You can then open each of these copies and edit each one on its own. This creates three pages that have the exact same page layout, but different content. Proper file management (folders, etc.) for exported graphics and HTML files. Include at least one graphic on your pages that you will use as a hotspot in Dreamweaver for an external link (school or employer logo would work). 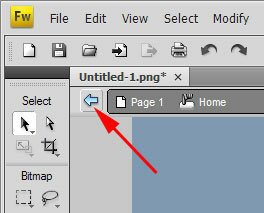 Include an empty slice somewhere on one of your pages that you will use to create an image rollover in Dreamweaver. Fireworks CS4 is very similar to Photoshop. 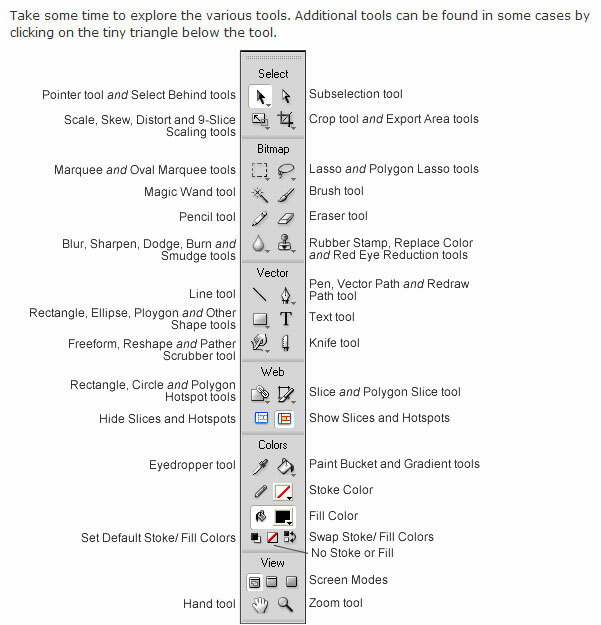 In fact, you'll notice many of the exact same tools found in Photoshop in the Fireworks toolbar. The program is fairly easy to use, but you'll want to follow some of the basic pointers below to help you get started. After starting Fireworks, click CREATE NEW FIREWORKS DOCUMENT (PNG) from the startup window. You will be asked to create settings for your new page. You should set your width to at least 950 pixels (to fit your banner graphic) and the height should be at least 600 pixels. You can also change the site background (canvas) colour at this point. Click OKAY to begin editing your page. You can modify the page settings later by opening the MODIFY menu and selecting CANVAS (provides settings for canvas size, colour, etc.). Take a few moments to become familiar with the interface. You'll notice that it looks very similar to Photoshop. Adobe deliberately designs many of its programs to have similar features, making it easier for you to transfer skills learned from one program to another. When designing your web page, one feature you are required to include is multi-state rollover buttons for site navigation. For the resume site, you should have at least the following: HOME, WORK HISTORY, SCHOOL HISTORY. Buttons can have up to 4 states - UP, DOWN, OVER and OVER WHILE DOWN. This means that you essentially create up to 4 separate graphics for each rollover button you create. It's not as daunting as it may sound. TRY IT OUT! Create a 3-state button below! Create a new blank page in Fireworks (or use the current page you are working on). Select the RECTANGLE tool from the toolbar at the left of the screen. Draw a rectangle that is 100 pixels wide by 40 pixels high (you can check the size in the property inspector at the bottom of the screen). Make the fill colour bright red. Select the TEXT tool from the toolbar and draw a text box over the rectangle (make it slightly smaller than the rectangle). 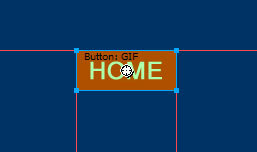 Type the word "HOME" in the box and change it to Arial font, 24 points in size and centre-aligned in the text box (see fig. 1 on right). Select your PICK tool from the toolbar (arrow at top) and select both the rectangle and the text box (either left-click and drag around items or click on one item, hold the SHIFT key and click on the other). Open the MODIFY menu, open the ALIGN flyout and align the two object vertically and horizontally. This aligns the objectsperfectly for you. With both items still selected, right-click on them and choose CONVERT TO SYMBOL (or click F8 on the keyboard). A symbol pop-up window appears (see fig. 2 on right). Give the button a name (ex. "HOME") and make sure the BUTTON option is selected. Click OK. You should notice that a transparent green box appears over your graphic and red lines appear on the page (see fig. 3). This indicates you have converted the objects into a button graphic. Double-click on the button graphic. This brings you into button editing mode (you'll notice the background of your page is now faded out). You are now looking at state #1 of the button (or UP state). Click on the NEXT STATE button in the lower right of the main workspace (see fig. 4). This takes you to the OVER state of the button. It should appear blank. Click on the COPY UP GRAPHIC button at the bottom of the screen to create a duplicate of the UP state (fig. 5). The rectangle and text should appear. Select the red rectangle and change the fill colour to orange. Leave the text white. Click on the NEXT STATE button again to move to the DOWN state (or state #3). Again, the screen will appear blank. Click the COPY OVER GRAPHIC button (as in step 8) and the button objects should appear again. Select the text and change it to a dark blue colour. Click the small blue arrow at the top left of the main workspace (see fig. 6) to return to normal editing mode. The background should reappear as normal and the green slice should reappear over the button. 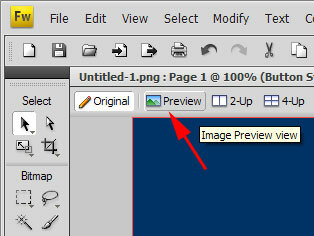 To see how the button will behave on your website, click the IMAGE PREVIEW button at the top left of the workspace (see fig. 7). This provides a simulated view of what your site will look like in a real browser. Move your mouse over the button to see what happens. To get back to editing mode, just click on ORIGINAL beside the preview button. If you want to make a series of buttons that behave the same way, you can simply copy and paste the original and change the text. Follow the steps below to try it out. Select the button created in the steps above and copy (CTRL-C) and paste (CTRL-V) into your workspace. The button will appear right on top of the original. To move the copy but keep the buttons aligned, use the down cursor/arrow key on the keyboard so the copy sits just below the original. 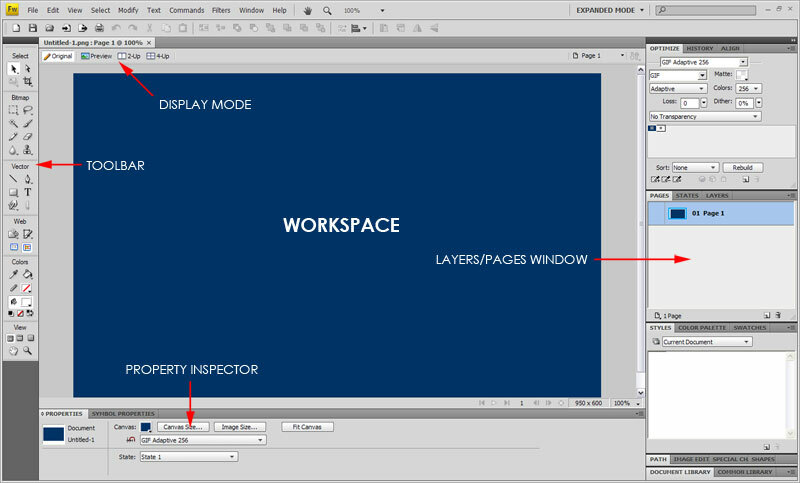 While the copy is selected, change the TEXT field in the property inspector at the bottom of the screen to "WORK" (see fig. 8). The button text should change to "WORK" as well. Repeat this process and create another button with "SCHOOL" as the text. You now have 3 buttons that all behave the same way. Click the PREVIEW button again to see how the buttons turned out. Each one should feature the same rollover states. Congratulations! You've successfully created a simple site navigation menu using rollover buttons! BEFORE STARTING THE EXPORT STAGE OF YOUR FIREWORKS SITE, YOU MUST CREATE A WEB FOLDER STRUCTURE! In your "My Documents" folder (or comm-tech folder if you've created one in your account), create a folder called "Resume_Site" (use underscore - NO SPACES). To create a new folder, choose NEW - FOLDER from the FILE menu and rename the file. Open this new folder. Inside this folder, create two subfolders called "Images" and "Graphics" (use same process above). The Images folder will be used to save all your exported images from Fireworks (see instructions below). The Graphics folder will be used to save the finished Fireworks graphics files (can drop and drop files into this folder after you have finished all editing and exporting). Once you have completed your page design for your website in Fireworks, you'll need to export the file in HTML format for use in Dreamweaver. 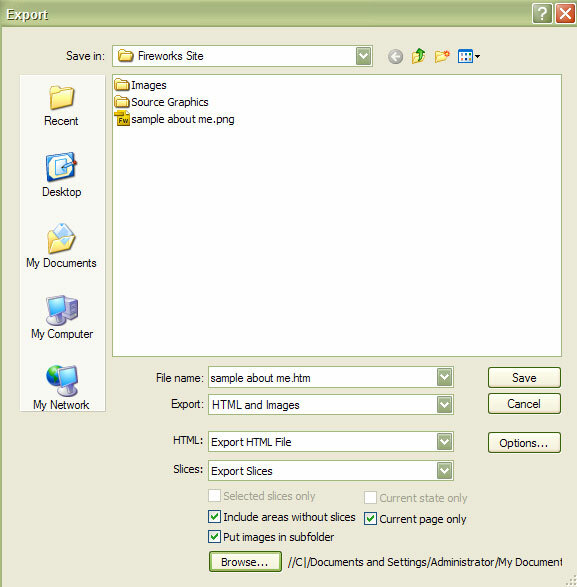 This will allow you to manage the Fireworks pages and create links using the easy site management tools in Dreamweaver. Follow the steps below to export your material. Once you've finished your page design, open the FILE menu and choose the EXPORT option. The EXPORT pop-up window will open. Make sure you are saving your file to the correct folder for your website (Fireworks Resume). Use fig. 9 on the right as a guide for settings. Make sure you have HTML & Images selected from the EXPORT field. Give the file an appropriate name (no spaces or punctuation). Make sure Export Slices is chosen in SLICES field. VERY IMPORTANT - ensure that the box beside PUT IMAGES IN SUBFOLDER is checked and select the IMAGES folder in your Resume folder that you created above as your location. You may have to use the BROWSE tool to find the correct folder. If you don't do this, your website root folder will be filled with all the linked graphic files for your page. Click SAVE once you have all the correct settings. You now have an HTML version of your page that you can open in Dreamweaver. In Dreamweaver, you will be able to create links, etc. as needed using your buttons. Repeat this process for each of the three pages you created for your resume site. When complete, drag/drop or copy the Fireworks PNG files into the GRAPHICS folder you created above.